Lumpiang Sariwa is also called Fresh Lumpia to distinguish it from its fried counterpart. 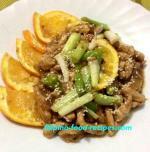 It is usually made using assorted vegetables such as green beans, carrots, and sweet potatoes. 5 Turn the heat off, then mix in the cabbage. Residual heat will partially cook the cabbage. Strain, then set aside while you prepare the wrapper and cook the sauce. 6 Make the lumpia wrapper. 7 Cook the lumpia sauce. 8 To assemble, lay the lumpia wrapper, put a piece of the loose leaf lettuce on top, add 3 tablespoon cooked vegetables and wrap with part of the lettuce sticking out. 9 To serve, the sauce goes on top of the lumpia, then topped with ground peanuts. Buy the curly leaf lettuce instead of the regular loose leaf lettuce if you could find them. They are more appealing especially if you are to serve this as a party dish. The cooked vegetables should be thoroughly strained before wrapping so it does not soak the wrapper. 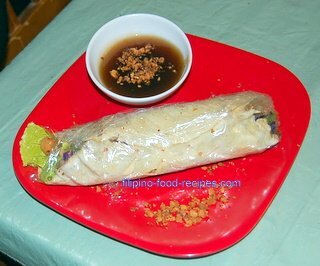 Wrap the individual Lumpiang Sariwa on wax paper to keep it fresh. Refrigerate if you are not to eat them right away, then microwave before serving.